Hello! A warm welcome to you all. This is my first blog post. I've been a blog stalker for way too long now and thought it time to jump in and have the opportunity to share my creativity with others. I love sharing the art of rubber stamping and paper crafting. Please know that you are never alone. There are many of us out there willing to share and be of inspiration. That is my wish for you....to be inspired. I had just received my first stamp set and markers from Stampin' Up! The demonstrator showed how to block color your image with markers....I was hooked! And have been ever since. I still have this set...don't use it anymore. But don't we all have those sets that we just can't part with? Thanks for stopping by today. Come back again soon! 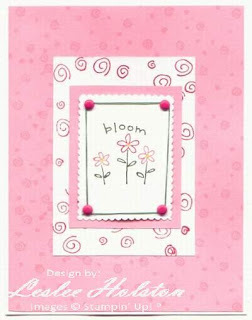 I love this card... it is so simple and yet elegant! I hope to get by for one of you events but I work all Saturdays! Have a great week. I look forward to your postings!